Dr Doupis is a former Clinical Research Fellow of the Joslin Diabetes Center, Harvard Medical School, in Boston, MA, USA, and Scientific partner in Beth Israel Deaconess Foot Center Harvard Medical School, Boston, MA. 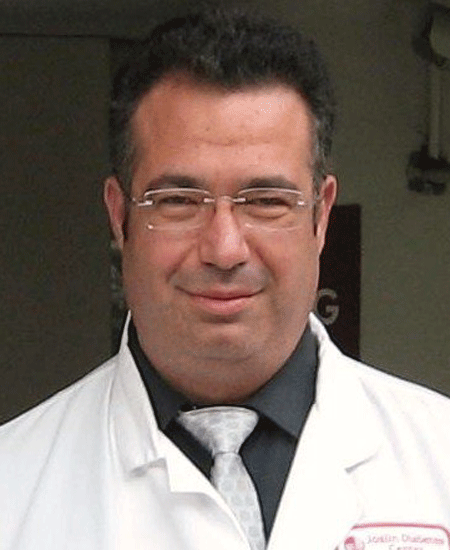 He is currently directing the Diabetes Division of Iatriko Palaiou Falirou Medical Center as well as, the Internal Medicine and Diabetes Department of the NS Naval Hospital, in Athens Greece. He is also a Tutor for Diabetes Diploma in Cardiff University Medical School supervising also MSc students. His special areas of interest are Diabetes and its complications, especially the Diabetic foot and Obesity. In these fields, he has participated in a substantial number of studies, most of which have been either published in International journals or presented in international congresses. He has also served as a Principal Investigator in multi-center clinical trials. His Doctoral Thesis was also diabetes oriented. He also has special interest in Diabetes related Smart Technology including mobile apps and Telemedicine. In addition, he is a registered reviewer in many major diabetes medical journals and a member of the editorial board of many medical journals. His teaching experience includes courses on Diabetes in Harvard Medical School students in Boston MA as well as subjects of “Internal Medicine”, to the students of Athens University Medical School. In addition, he has had the opportunity of tutoring PhD students, at the 1st Dpt of Medicine, Athens University Medical School. He has given numerous lectures in national and International congresses presenting also more than 200 Abstracts.